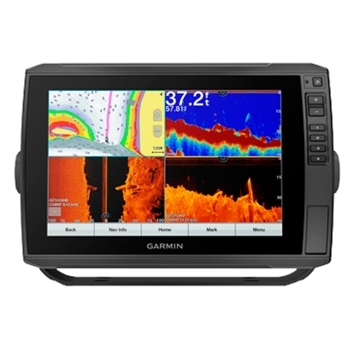 Garmin's ECHOMAP Ultra 106sv pairs a bright sunlight viewable 10" keyed assist touchscreen display with an UltraHigh Definition (UHD) GT54-Transom Mount transducer - providing exceptional sonar images on a large screen. At the heart of the 106sv is an internal 10hz GPS receiver that quickly and accurately locks into position allowing you to explore the lakes and coastal waters throughout the US without waiting forever for your unit to find your location! Detailed g3 mapping for both U.S. lakes and coastal waters now include Navionics data and auto-guidance! Use your desired depth and overhead clearance and easily calculate a route and find a path to follow! With Dual microSD card slots your enhanced mapping options are nearly limitless. Add lakeVu Ultra G3 for inland Lakes or G3 Vision for coastal waters to enhance your data with information such as 1' contours, unique 3D views, Shallow water shading and More! Internal storage keeps up to 5,000 waypoints, 100 routes and a track log that stores 50,000 points and 50 saved tracks you are sure to always know where your favorite fishing spot is! 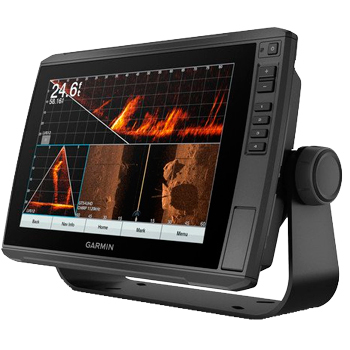 Sonar capabilities abound in this unit and with the included 12-Pin GT54-UHD TM Transducer provide UltraHigh Definition CHIRP sonar, ClearVu for near photolike detail below your boat and SideVu sonar for near photolike detail to the left and right of your vessel. 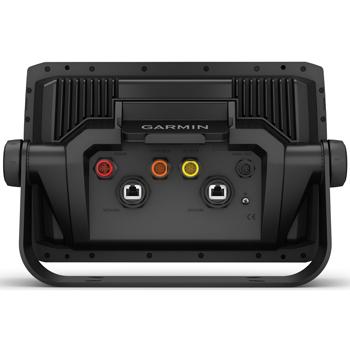 The 106sv is also Panoptix LVS12 ready with the LVS port directly on the back of the unit and can also pair with Garmin's full line of Panoptix Transducers including the extremely popular Panoptix Livescope! Plus, when paired with the included GT54 transducer the EM 106 will allow QuickDraw Contour mapping where your software instantly creates personalized fishing maps on screen with 1' contours as you fish. Wanting multiple displays, but not needing all the bells and whistles of a fully networkable unit? The echoMAP Ultra has you covered, with 2 network ports the 106sv will allow you to connect and share sonar, waypoints and routes with other ECHOMAP Ultra 10" and 12" units as well as ECHOMAP Plus 7" and 9" units. Plus with Built-in Wi-Fi you get full access to the all in one ActiveCaptain app - a simple yet extensive connection between your mobile device and your plotter. Access maps and the QuickDraw Community, plan a trip, prefish a lake and even get texts and emails on your display (but that’s only if you want to, this can be turned off so you can enjoy a carefree day on the water without being bothered) - you can even use your mobile device to view and control your display so that you don’t always just have to stand at the helm! With 1 NMEA0183 input and output port, Wireless connectivity, and NMEA2000 you can connect and support heading sensors, autopilot, digital switching, weather, FUSION-Link and more! And when you day of fun on the water is over, the 106 quickly and easily disconnects from the quick-disconnect mount. Since all the cables are plugged into the mount there’s no need to mess with plugging and unplugging cables. Simply remove the head unit and store it away for safe keeping! ECHOMAP Ultra 106sv with BlueChart g3 and LakeVü g3 for U.S.